Negative-pressure pulmonary edema treated with nasal high flow ventilation. The authors describe an unusual treatment with nasal high flow ventilation for a negativepressure pulmonary edema occurred during intense inspiratory effort with upper airway obstruction after shrouding. High-flow nasal cannula oxygen therapy, Negative-pressure pulmonary edema, Acute respiratory failure. Negative-pressure pulmonary edema (NPPE) is a rare lifethreatening form of sudden onset, noncardiogenic pulmonary edema that can occur after the relief of an upper airway obstruction and in otherwise healthy young persons who are capable of producing large markedly negative intrathoracic pressure. Typically, the evolution is rapidly favorable under supportive care with immediate oxygen supply. A 16-year-old man without medical history of cardiac or pulmonary disease presented to emergency department for tachypnea, inspiratory cough and haemorrhagic sputum with normal blood pressure (114/82 mmHg) and sinusal tachycardia (106 beats/min). According to his father, he was buried under a heap of corns and was excavated after about 4 minutes. When his face was uncovered he was cyanotic but conscious and able to breathe after having cleared his upper airway himself. Peripheral oxygen saturation was 90% under 100% oxygen flow through a nasal mask. Pulmonary auscultation revealed bilateral rales and crackles. The initial arterial blood gas demonstrated a PaO2/FiO2 ratio of 91 mmHg. Cardiac enzymes were normal. Chest radiograph revealed bilateral alveolar infiltrate consistent with pulmonary edema (Figure 1). The computed tomography (CT) scan of the chest revealed macular alveolar infiltrations throughout both lungs (Figure 2). Electrocardiogram and echocardiogram were normal. The hypoxemia resolved over a period of 24 h with high-flow nasal cannula (HFNC) oxygen therapy (OptiflowTM, Fisher and Paykel Healthcare, gas flow rate of 50 liters per minute and FiO2 of 1.0). The patient was discharged from intensive care after 72h and had an uncomplicated course. 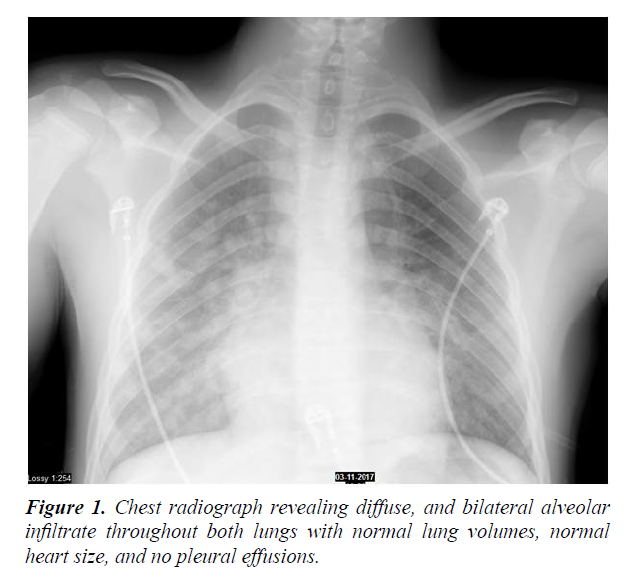 Figure 1: Chest radiograph revealing diffuse, and bilateral alveolar infiltrate throughout both lungs with normal lung volumes, normal heart size, and no pleural effusions. Figure 2: Series of chest computed tomography scan images done on admission to the emergency department show extensive apical and basal macular alveolar infiltrations throughout both lungs. Negative-pressure pulmonary edema (NPPE) is a welldescribed cause of acute respiratory failure and a form of sudden onset noncardiogenic pulmonary edema [1,2]. It occurs after a markedly negative intrapleural pressure generated by a forceful inspiratory effort against glottis obstruction generating very negative airway pressures, which augment transvascular fluid filtration and precipitate interstitial and alveolar edema [3-5]. Althought the cause of bleeding and then haemoptysis is uncertain, physical disruption of the alveolocapillary membrane might play a part . Chest x-ray and CT scans are essential to exclude some differential diagnosis (aspiration pneumonitis, pulmonary embolism, cardiogenic edema) such as electrocardiogram and echocardiogram to exclude a cardiogenic etiology. Resolution of the pulmonary edema is usually rapid, in part because alveolar fluid clearance mechanisms are intact . Supportive care must ensure a patent airway and an immediate oxygen supply [7,8]. The addition of positive end-expiratory pressure (PEEP) or continuous positive airway pressure improve pulmonary edema resolution [6,8]. HFNC, with low PEEP maintained by high-flow oxygen is an alternative to standard oxygen or noninvasive ventilation usually used to treat NPPE. Intubation and mechanical ventilation are only occasionally needed. The use of diuretics or steroids remains unclear, controversial and seems unnecessary . NPPE, well known among anaesthesiologists because often reported as a complication of laryngospasm after extubation, is an uncommon diagnosis made in the emergency department. This case is presented to increase prehospital emergency physicians' awareness with the knowledge base necessary to consider the diagnosis of NPPE in the setting of acute respiratory distress after history of upper airway obstruction and to expeditiously treat the pulmonary edema and then prevent its potential lethal consequences. Bhattacharya M, Kallet RH, Ware LB, et al. Negative-Pressure Pulmonary Edema. Chest. 2016;150(4):927-933. Tsung AH, Slish JH, Lisenbee NP, et al. Postobstructive pulmonary edema in a 40-year-old man after suffocation by a swimming pool cover. J Emerg Med. 2013;45(5):670-3. Oswalt CE, Gates GA, Holmstrom MG. 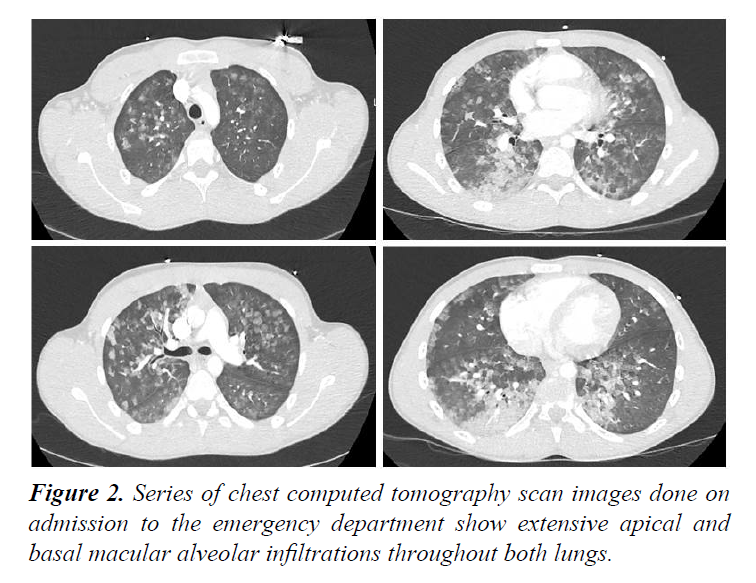 Pulmonary edema as a complication of acute airway obstruction. JAMA. 1977;238(17):1833-5. Glisenti P, Rakusa J, Albrecht R, et al. Negative pressure pulmonary oedema with haemorrhage after 5-minute avalanche burial. Lancet. 2016;388(10057):2321-2. Lemyze M, Mallat J. Understanding negative pressure pulmonary edema. Intensive Care Med. 2014;40(8):1140-3. Schwartz DR, Maroo A, Malhotra A, et al. Negative pressure pulmonary hemorrhage. Chest. 1999;115(4):1194-7. Udeshi A, Cantie SM, Pierre E. Postobstructive pulmonary edema. J Crit Care. 2010;25(3):508.e1-5. Koh MS, Hsu AA, Eng P. Negative pressure pulmonary oedema in the medical intensive care unit. Intensive Care Med. 2003;29(9):1601-4.